The other day I talked about historical CD rates and today I will look at CD rates versus inflation. Right now savings rates are not really keeping pace with inflation. Thats unfortunate since if you want to save money in a safe CD or savings account your money will lose value even after the interest paid on your savings. I took the CODI rates from Mortgage-x and then I got the CPI inflation numbers from the BLS. Here is the CODI versus the CPI. Usually the two are not too far apart. However there are periods when theres a few % difference. 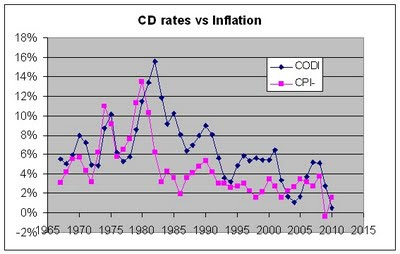 Sometimes the CD rate is higher than inflation and sometimes its lower. Now lets subtract the inflation rate from the CD rate. This will give a rough estimate of the real rate of return from CD savings. The resulting numbers are shown in the graph below. As you can see several years the real rate was negative. That means that your savings interest payments aren't keeping up with inflation. In 10 out of 44 years the real rate of return was negative. The worst year was 1979 when the real return was -2.78% and the best year was 1982 when the real return was 9.40%. During that time inflation was very high. From 1967 to 2010 the average real return is 1.91% and the median annual real rate of return is 2.17%. 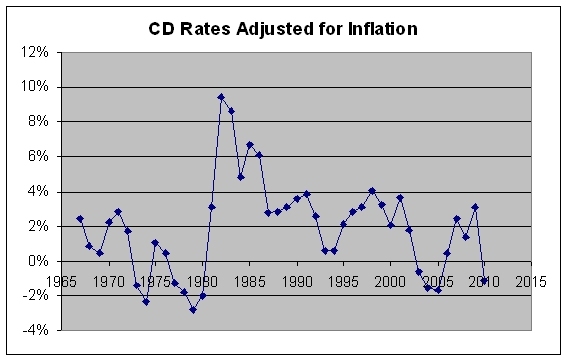 Bottom Line : Over the long run then I think its fairly reasonable to expect CDs to return about 2% over inflation.